On the face of it, the Lower East Side Gallery scene in Downtown Manhattan seems to defy economic logic. Those spare white storefronts exist, somehow, in one of the most expensive retail areas on the planet without much visible inventory, client base, or clear income. Yet they persist, with more seeming to pop up every day. 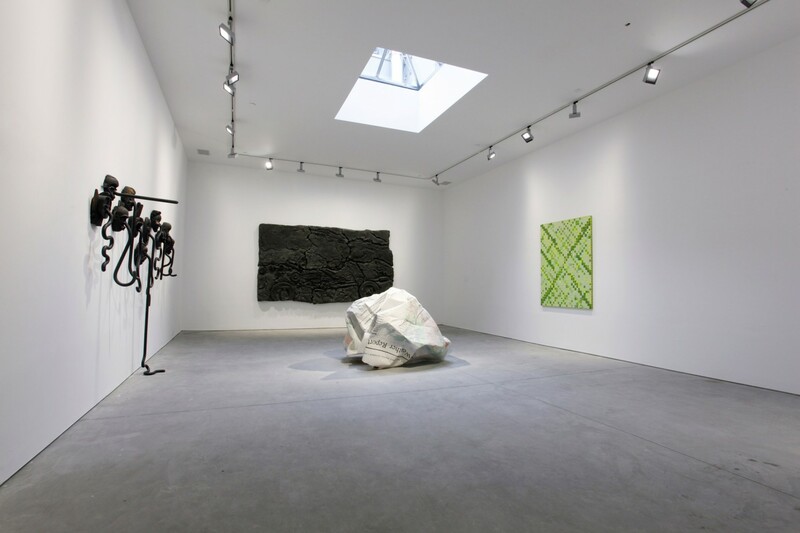 The most recent addition to the neighborhood is the Richard Taittinger Gallery on Ludlow Street, which had its opening reception last night, March 3. The 34-year-old founder of the eponymous gallery was kind enough to share with us the steps he took to create his own glistening cube from scratch, and what he’ll need to do to keep it going. In 2005, Taittinger (his great grandfather founded the champagne house Taittinger) moved from France to New York, a city he calls “energetic but tough.” After stints at the auction house Phillips de Pury and the Paris-based Galerie Almine Rech, Taittinger opened his own art consultancy business in 2010, at which point he made his first solid step toward opening a gallery. By advising aspiring collectors on which artists to patronize and artworks to buy, he was able to develop a loyal client base that trusted his taste implicitly. After developing a core group of followers, Taittinger set out to find a decent storefront, initiating phase two of the gallery-opening process. With his own exhibition space, he could graduate from being a mere middleman—forced to negotiate among artists and dealers and collectors—to finally representing artists on his own terms. The process took two years. He began by eliminating some of the more expensive possibilities. “Unless you have $20 million, Chelsea doesn’t make sense,” he says. Instead, he settled on Chinatown or the Lower East Side. “I sent three interns to go out and post signs on the street, ‘Looking for Space, 5,000 Square Feet,’” Taittinger says. He got a friend in China to write a classified ad in Mandarin to request vacant retail space in Chinatown. Finally, last September, an agent in Long Island City told him that a building that is “column-free, 20-foot ceilings, and the same block as [the long-rumored new location of] Soho House,” was available. Taittinger made an appointment immediately. A few weeks later he’d closed on a 15-year lease for $25,000 per month. The building was formerly a famous downtown music venue called Living Room, which had sat empty for more than a year and required major renovations. Taittinger got five estimates for the construction work—the highest was $1.5 million—and settled on the lowest, $500,000. Next came finding artists for the gallery. He’d already established relationships with a variety of international artists; the gallery’s focus, he says, is highlighting international artists who’ve been overlooked by American collectors. “Especially when you’re coming from an auction side, they say you should just do paintings” in a new gallery that hopes to make money, Taittinger says. “But I don’t think about it that way, I think about how important the artist is, or will become, within art history.” Most of the artists he has found are represented outside the U.S., like Chinese artist Ding Yi, whose work sells for hundreds of thousands of dollars, primarily at auctions in Beijing and Hong Kong. For whatever reason, the artists Taittinger has found haven’t made it to the New York art market. His first show, which runs through March, includes work by Haluk Akakce, a contemporary artist from Turkey, Recycle Group, a Russian art collective, and Theo Mercier, a Paris-based artist who was hanging a series of disfigured masks in the background as Taittinger spoke. Taittinger employs five people, including a gallery director whom he considers a partner in the endeavor (though of course, partnership implies parity, and Taittinger is his boss). It’s not a large team, but it’s enough people to organize the paperwork and negotiations and handle logistical hurdles necessary to hang what he says will be a new show every month. Taittinger says he has already sold five of the artworks ahead of the opening, though he won’t say which. For now, he’s simply thrilled that it has all come together—and that brings us to the final phase: creating a sustainable business model. It could cost up to $100,000 a month to run a small gallery like Taittinger’s, including salaries, rent, insurance and other expenses—which means the pressure is high to sell through monthly shows of work costing $15,000-$200,000.